Body Transformation: Zain Smiles In The Face Of Pain! Larger boys called Zain a runt and smashed his pride to pieces. See how he got the last laugh and put years of hard work into a body destined for greatness! I wanted to transform primarily because other guys told me I was a skinny runt. I took their hate and criticism to heart and built the drive, motivation, and support to start a transformation that took years to finish. I always wanted to be a bodybuilder growing up. I looked up to my dad who was a bodybuilder and cultivated motivation from my icon, Arnold Schwarzenegger. I always wanted to look good in clothes, live a healthy life, break into fitness modeling, and compete. I decided to change my physique and take it to next level with motivation and dedication to become who I am today. When I was younger, I was athletic and sports came naturally. I was blessed with good genes, but found it difficult to gain weight and muscle mass. At age 16, I admired Arnold's physique and created a diet and weightlifting plan that ultimately resulted in the physique I admired. Bodybuilding requires drive, commitment, and discipline. Motivation to hit the gym every day and eat properly came from an inner strength that I depend on daily. I downloaded motivational quotes from professional bodybuilders onto my phone and used their words of encouragement to reinforce my efforts in the gym. I accomplished my goals by maintaining and working toward my ideal goal. Fitness became a way of life. 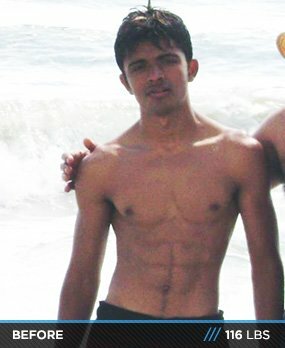 My efforts culminated in a great physique that I can be proud of. I accomplished my goal, but I have more to go. When I started, my diet was geared to gain weight, which didn't work well. As I started taking lifting more seriously, my nutritional plan changed drastically. Dieting was the hardest part, but I learned over time and it became less challenging. My fast metabolism was another challenge. It's hard for me to put weight on, so I ate at least four meals per day with a couple protein shakes. This journey is never going to end. I plan to compete more and get a pro card. I have already shot with one of the best fitness photographers, so my next goal is to be featured in a magazine or website. Eventually, I want to be a sponsored athlete. Dedicate yourself, be motivated, and be organized. Take pictures from the beginning and keep taking them. Dieting is the most important aspect of fitness. 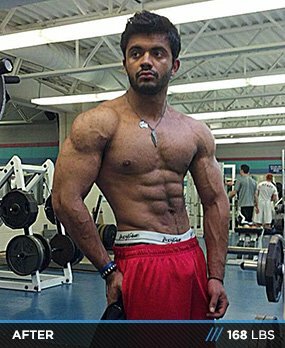 Bodybuilding.com gave me everything I needed. It's the best fitness and supplement website on the Internet and provided me with daily exercise ideas and inspiration.